A musical legacy that began in Hawthorne, California and went on to conquer the world. Analogue Productions presents the ultimate pressings of 14 essential Beach Boys albums! Mastered by Kevin Gray, most from the original master tapes, now presented on Hybrid Stereo SACD, these are awesome recordings to experience. The Beach Boy's Holland, the group's 19th studio album, was recorded in Baambrugge, Netherlands in the summer of 1972 and released in January 1973. By mid-1972, with Brian Wilson's focus waning from the Beach Boys to other creative outlets, and his personal and health-related issues mounting, Wilson was producing less music for the band than ever before. They decamped for the Netherlands hoping to jump-start Brian's creative energies. 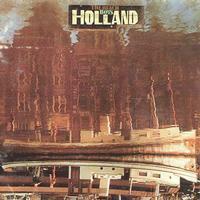 Upon the band's return from the Netherlands in the fall, Holland was rejected by Reprise Records for not having a potential hit single. Added to the track list was an unfinished Brian Wilson song "Sail On, Sailor," that he'd originally co-written with Ray Kennedy, and finally completed with the help of Van Dyke Parks, Jack Reiley and Tandyn Almer. It would ultimately become Holland's most famous track.